It's time for another Sports Fan Friday! 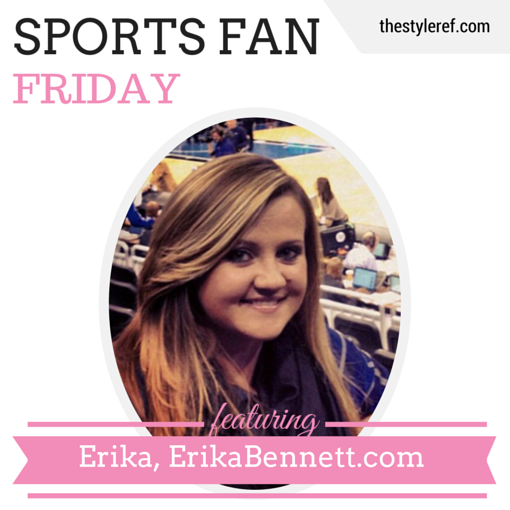 Let's get to know Erika from her self-titled blog, ErikaBennett.com. What do you write about? A lifestyle blog focusing on personal style and beauty products. What’s your connection to these teams and why are you a fan? I was born a few years before the inception of the Orlando Magic, so I’ve grown up going to the games. I’ve seen everyone on the court from Dennis Scott and Shaq in the early years to Dwight Howard and J.J. Redick in more recent years. Basketball has always been the sport to watch in my family. Describe your go-to gameday outfit: Since Magic games are indoor, I like to take the time to get a bit more dressed up. I love black faux leather leggings and a blue blouse with flats. It’s hard to climb all those steps in heels! Favorite places to shop for team gear: Since we’re so close to the Amway arena, and their fan store, I tend to hit their Black Friday sale with my sister each year, and stock up on t-shirts and other team paraphernalia. Favorite gameday tradition: Each year, on the home opener for the Orlando Magic, my sister and I put on our t-shirts, pour ourselves a drink and enjoy the game together. Fill in the blanks: I love to eat chips & queso and drink Angry Orchard beer on gameday. Best sports fan memory: In 2012, my sister and I were able to attend a private event at Amway Center with other ticket holders.We were able to spend the entire afternoon walking around, getting down on the court, and of course, having our pictures taken with J.J. Redick and Ryan Anderson. Every season, I hope that… Every season I hope that the Magic make it to the playoffs. It’s been a bit more a struggle, with the whole “team rebuilding” stage, but it will only make those playoff games more special.